My list of things I wanted to do in Japan was, Sail, teach Kung Fu and study/practice Chan, do ceramics, Kyudo and restart playing music. This for the most part it has or is coming together. It looks like I am finally hooked up with what will be a regular music-group, a trio. A more or less Blues Trio. We have two gigs coming in Sept. This past Friday, I went over to Chicago Rock Nite Club. Matsuo-san, band leader and another guy were playing. I was scheduled to come by and basically sit in and rehearse for our gig next Sunday. We were lacking a drummer that night as Mukesh could not make it. What is interesting about our combination is we are all more spent lived in the Bay Area. Both Mukesh and Matsuo-san are from Japan, but went to school in the Bay Area. So we all speak English, they are fluent in Japanese. We met in a round about way via the Blues 4 Bali shows and another Japan resident from the States. We have played with each other but as yet have not all together yet. This will be the members of the Matsuo Blues Band. 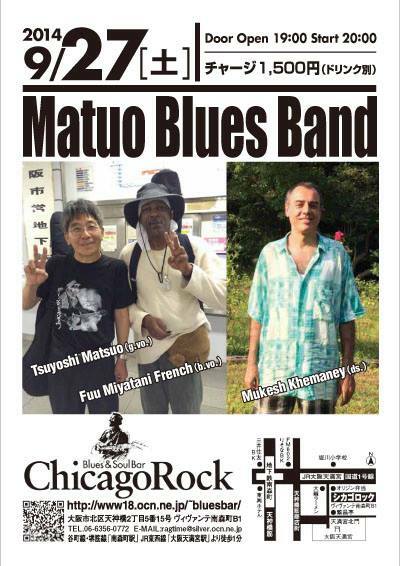 So Friday I sit in with Matsuo-san for a set. It is basically him and me doing a live rehearsal and promo for our up coming gig end of Sept there. It was kind of cool. Even with no drummer a couple of the songs sounded pretty decent. With some rehearsal time and drummer we could sound pretty good. The people at the club enjoyed it. Of course around 9:00 pm when we played they were all pretty faded (slag for buzzed), so almost anything would have sounded ok to them. I did make the decision to go back to playing a 4 string Bass and give up the 6 string, at least for now. For the kind of tunes we are playing it is not really needed. Also it takes more practice than I have time for to get the chops I want, for what I want to play and sound good, all whilst singing and playing the Harmonica. I do like having the extra low string, perhaps I will sell the 6 and get a 5 string. That is a good middle ground I think. I see, I also have my late brother’s 4 string so I will play with that for a while. Ok, so back to the club, the other guitarist playing with Matsuo-san played again with us on the last few songs. He does a good job on sounding like a Black Blues man when singing. I am not that pleased with my voice on the songs. Although others have said I sound good. I think part of it is the weak sound system at the club. I did not get to adjust the tone. I will try that when we play there again. Here is the last song of the night. I am not sure if you can view this link to Facebook. 12 bar shochu blues. LZ and I were invited to go with our friends the Aoki to their friend’s house in Wakayama. This couple in the mountains of Wakayama are professional potters. One of the things I wanted to do here in Japan was some ceramics. Aoki Sensei had promised us to go visit this couple, finally the time arrived. There were to be I heard about 12 people there, so it was a small party. From Osaka to the mountain house it was about a two hours ride. I was all eyes watching the countryside. We made our way through the valley and up the mountain, with a small stop at a roadside veggie stand. Once at the home of the potters we took in the sights. There was a great view of the valley below. There were lots and lots of pots around. It reminded me of another time we visited a potter village near Kyoto. Anyway this home was amazing, a couple of studios, four wood burning kilns, a little outside patio. A bathhouse with a fire heated bath was being built by a guy who is traveling around Japan via motorcycle doing odd jobs. There is also an outside kitchen. The house itself was self-built by the owner and his friends. It was quite interesting, beams and support post where whole tree trunks and branches left intact and placed in use. A small pond was in front of the house, with the largest lotus flower in bloom I have ever seen! I did not know they grew so big. We walked around and took in the misc sights. A garden, plums which had been picked drying in baskets, stacks and stacks of wood, shelves and shelves of ceramics. Great vistas! After a short while it was time for lunch. We all gather at the table. What a spread it was! Food, food, food and a large bowl of Sake that kept being refilled. We ate drank and laughed. Afterward, Aoki Sensei made Macha. He brought his tea set along. It was quite good. I was asked several times to play something on the piano. I was very hesitant, not feeling ready. Something small, something small pushed Misako-san, Yoh Sensei wife. Ok I finally said. I did want to play a bit on a real piano not my electric one. Played, improvised some on some blues changes. No one seem to notice, or care, they were busy talking. So I started just playing for me. It was starting to get into it as it was starting to sound to me pretty good, considering my small skills and I am a hard judge on myself. A short bit later LZ calls me to come over and get a gift from another visitor. He was from Tokyo, here on a buying trip for his new noodle restaurant. He did some painting, inks and gave out a few. He said they were nothing special, I found a couple that were appealing. Whilst handing out the inks, he stopped and thanked me for playing and mentioned it to the others. As a Jazz lover he was really the only one I think appreciated my efforts. That helped my spirit some, still, I made a mental note not to do that again. I am pretty sensitive about performing. After all of that was done, we were told we would go make some pottery items. Now I was really pleased. I did not expect this. We were given a block of clay and everyone did something. We did not use the wheel, that takes some skill and can be messy. Everyone did hand formed works, even LZ get in on the action. Misc items were produced. I did a couple of pinch pot designs, even though I had said I did some ceramic work in the states, most seemed surprised. They were really impressed when I quickly did a tori lamp. once I got started I wished I had more time to refine it. It was done very quickly after I did a couple of other things, like Incense holders. It came to me to do this lamp. It was quite rough in my eyes, but everyone was more impressed with that than my not their style piano work. I could never be a street musician playing for people that are mostly not interested. Once everyone finished with their pieces they were left to dry. The owner will fire them at some point. I am curious how the my pieces will turn out. I am sure it will be a long while before I see the end results. The lamp is for my garden. I am redesigning a part of it. Since we have the a/c unit fan now I can not have plants or the planned Kung Fu training unit in front of the now A/C fan. After the pottery break we did some more sight-seeing on the property. I walked around looking more at details now. The art in the garden, the pond, which had not only carp but a bunch of frogs. Soon it was time for dinner. Once again we gathered at the table and agin the spread of food was laid out. Oishii! There were some homemade pickles from cukes and eggplant with the best flavor I had tasted! Also again more sake flowed. After eating it was time for us to leave. The Aoki’s had decided to stay the night. The guy from Tokyo offered to gives us a ride to the train station as he and his assistant were going to stay at a local inn. That was appreciated. LZ and I both napped on the ride to the station after so much Sake. I had noted during the meal that his assistant, the driver did not drink much. A good thing as the road was quite curvy down the mountainside. This was our first Japanese dinner party, ( full pictures can be viewed here) it was quite enjoyable to be around artsy people again. It is also interesting the difference in being around visual artist compared to musical artist. I can not explain it. Perhaps because visual artist surround the, selves more with it in their environment. Anyway, it was an enjoyable visit to the mountain. This is the couple’s website. With everything from the past lives’ of planning gone, and being here, in Nihon starting over, at this age, requires mediation, work, faith, and planning. With thinking of one’s future, one has to understand their past. Japan is an interesting place for me to be. I never had any past dreams or plans to live in Japan, much less retire here. I am defiantly a foreigner here but I feel strangely comfortable. I have lived in other places for short times, Hawaii, Singapore, Canada, Mexico, in all even though I liked them, did not feel as comfortable to my spirit as Japan. F#CKEN WHITE PEOPLE!!! .. Story by a White Guy!!! Japan Life 101: Being Black… What’s it like? Anyway for people of Color from the States, perhaps because we live everywhere as an outsider, even at “home” it is a way of life. International views of the current “race” problem in America – Ferguson. Sometimes it is being the only Black with a group of Chinese, Philippines, Mexicans, or Caucasians. Sometimes it is just being a person of color in America. As for me, even within the Black Community I feel an outsider. There is the “not black enough”, or you are one of those hippie types groups. Groups within groups. Part of, yet not part of. Once I understood that, I followed my heart and interests, not the group. My brain is wired different, I was not raised with a sense of Africa, perhaps (because of the mixed bloodline, Church, both? ), but a sense of human. “We All are God’s children” is what I was taught, back in the day! Flowers have different colors, types, scents, but they are still flowers. This is normal life for me.Japan for many people of color, especially from the states, Japan levels the playing field more than ( not fully level, just more level ) at “home”. ( example this video from Bill Cosby ) So that combo perhaps is why I am most comfortable here. Still Mexico in a way had that sameness, yet I felt more a outsider there. Perhaps it is a cultural interest factor, that balances the harmonics. However I had that in Singapore but felt no sense of “fitting”. So all that was just some reflection, leading to I like life in Japan. For me it is working. Many Japanese from Japan, in the states said I would have no problem living here. lZ has said it is beyond her hoped expectation that I could adapt. For whatever reason, past life, studies, interest, power spot, it is working and has been overall a positive experience. Both the people and the place. I do not miss being in the States. I do not have that Japan honeymoon mind, as I have seen/felt some negative as well. However, that is life, one day is sunny, the next cloudy, you deal with it. Jerks and stupid people live in all races, countries, groups. While on the race topic. In my “circles” of living here there are several groups of people, the Kyudo, Sailing, City gardener blue collar worlds. Many Japanese I meet have never met or spoke with an American, much less one of color. It is a basic exchange, Give respect, receive respect. I think they see me more as the “American”. Rather than the “Black” I could be wrong. What am judging by is they ask, where are you from? I say CA, without thinking, they say ohhhh America! I think being a man of color is second to be an American. Awww yes, I do recall two times people responded, strongly surprised to just seeing me. Both followed with smiles and relaxed, not fear and escape. Other than that I can recall no negative “racial” based negative encounter, unlike in the “Land of the Free”. There are some stories I can tell from the life there. Also with the craziness happening with the police , it is a good place to be FROM. Sunday was the day of the Tai Kai, it was also the day of a big typhoon hitting Osaka. As I walked from the train station to the dojo, It was raining pretty hard but not too bad. I wore my boating foul weather gear, so I was prepared. I arrived at the dojo just a little later than planned but not enough to be an issue, even for Japan. I quickly changed and signed-in and got a feel of what was happening. Today was to be a fairly large Tai Kai. There were three Dojos in attendance, that I knew of at least, so perhaps more. Including the one that would not let me join. That however turned out to be in my favor, as my current Dojo is much better. Anyway, the ones that remembered me spoke and everyone was friendly enough, one person even offered congrats on my passing the San dan exam. I have no idea how he knew. Now that I have done a Tai Kai before and I am a “local” it is a much more relaxed feeling for me this time around. I am part of a team this time for shooting. There are three of us, a Sensei , a Go-dan and me. Oh boy, I thought, good this is for fun. My group was number 15, so I had plenty of time to do my school chore, photography. I was ready, I had three cameras. One point and shoot on each wrist and my Nikon SLR around my neck. One point and shoot was a floater. I traded it off with another person when I was to be shooting, we were partners. Things ran smoothly with the shooting, and before I knew it I was up. I was feeling pretty relaxed for the most part. I knew what to do this time around and I was not the lead. That meant , at least in my head less pressure. I would do my best, but having a new Yumi I did not expect, to shake things up and be a force to deal with :-). My plan was to do the same as I did for the shinsa, only faster. Be fully in the moment. I missed my first three shots, oh well. On my last shot of four in the set, I thought I hit the edge of the mato. However it must have been on the outside and knocked on the rim because I received no point. Oh well I thought. I am not the only one with no hits. I went back to taking pictures, there were two more rounds still to finish. Whilst I walk around for some candid shots and different angle. It is nice being asked to do this, since I like doing the photos and I can now go places I would not have dared as a simple student. Yeah totally cool! A nice perk of being part of the “Wa”. 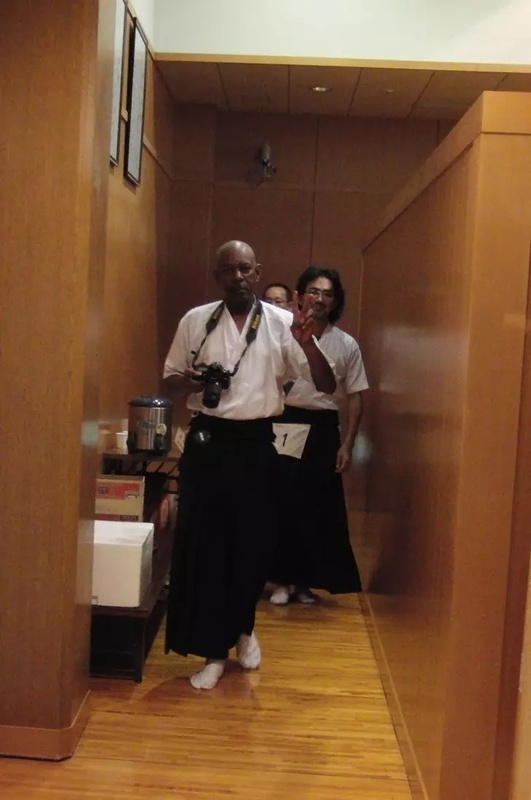 I encountered Watase Sensei, he said when I was shooting ( Kyudo ) or walking after shooting, something I did not quite get, but my toes should not cross the line. That is no good, all whilst pointing to the Dojo floor shooting area. Hai, I say and bow, being new to the Tai Kai thing. I figured there was a mark I did not see, know of. I made a mental note to flow my Sempai’s lead and alignment closer on the next round. Next round comes up. I have a better feel now for the yumi after targeting on the first round. I make the smallest of adjustments and shoot! Bam! A hit. Ok, nice, and let that go. Next shot! bam! Another hit. Too bad I am not testing for Yon-dan. Now I pickup the last two arrows. Breath, focus, relax…another hit! I am pretty shocked now, but did not dwell on it. It was time for my last shot. No thinking, just did the same thing, felt the shot more than saw the shot, much more felt, almost like there was a connection to the mato. Another hit! I get a big round of applause, since I was the only one to hit all four. Whoa I thought that was cool and surprising! Still I had to watch carefully as I exited, I did not want to step on any lines. Perhaps it was the exit I thought to myself about what Sensei had said earlier. The exit location was different from normal because of the Tai Kai setup. I heard something like a thats better remark this time, maybe it was just “hai” or good, as I changed my exit step and location. Later, I had to remember to use the proper polite and humble thank you response to the congratulations. Did I mention I was quite surprised to hit all four. So now lunch time. Everyone heads out to common area of the Kishiwada gym. The storm rages outside, but we are comfortable. How great it is to have a place like this at a time like this, well most times, just specially today. We are comfortable and dry whilst the other dojos needed to close for the day, as they are exposed to the elements. In the winter we stay fairly warm (more then being outside), on the summer fairly cool (fans), in the rain and Typhoon season we stay dry. The indoor dojo is a treat and a blessing. After lunch everyone gets ready for the final round. Soon it is my turn. I again watch my step as I enter and leave, following protocol. I try to repeat myself as before, therein lies one battle. Not to attach oneself to the last shots, the last performance, this one is new. Here is where some experience with detachment practice comes in handy. 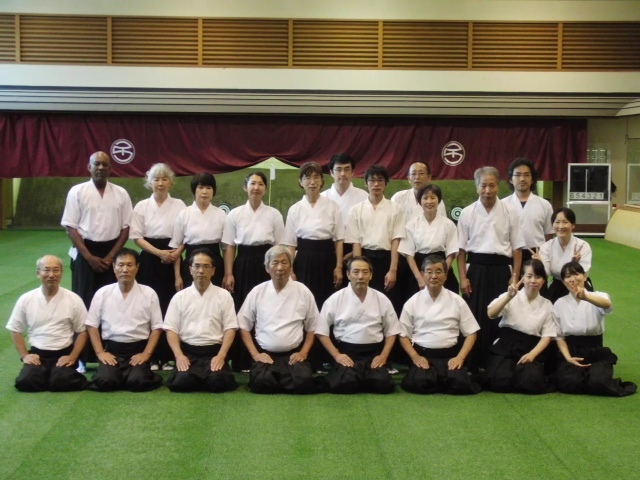 Although there are those that say you can not do Zen/Meditation and Kyudo at the same time. One or the other. Anyway focus on the breath and not the prize, non-attachment. Not shooting for the prize , just doing one’s best at that moment. My next moments were not as good as before. I hit my first shot only. I could hear a disappointment sound, behind me when the second ya missed. Oh well, some days it is sunny, some it is not. I am busy doing my photo thing when I told I have to do something else, shot again, as part in a final. Ehhhh I say! It is cleared up to say my group is shooting again, because we had one of the highest group score. We have a shoot off with another school for the championship! Once again I am shocked. Oh boy, I think, now some pressure, the casualness is over. We had one shot each, unless it was a tie. Sadly we lost, I missed, my sempai also missed. The sensei in our group hit. Two people hit in the other group. I figured out later looking at the pictures at the line up how we were arranged. There is one upper rank, but below Renshi rank shooter, one low rank, and one Renshi to a group. Anyway, no one was concerned that we did not win. It was all in fun even though there were some small prizes handed out afterward. The name of the Tai Kai is the Goodwill tournament and it was about everyone enjoying the day. Unlike the other tournament which finished late in the day, this one finished early afternoon. Once everything was cleaned up, packed, and put away to normal, many from all ranks took the opportunity to practice. I needed to catch the train before the next rain started, and since the wind was done, so I headed home. I was not into the Tai Kai scene back in the states, if I recall correctly they were only held when a seminar was held or one was coming, but here I am enjoying it. The people, the challenge, the practice, the group fellowship. Interesting I would feel more comfortable here, even not understanding most of the talk…oh well one of those vibe things. There are periodically discussions here that touch on the interplay of kyudo, meditation, competition and testing. At the risk of offending people, I’d like to start another such conversation. Hopefully it will not break down into accusations and insults. I’ll start with a few of my own thoughts, but I’m open to challenge on any of them. Mastering kyudo takes serious study and practice. A person practicing it is constantly experimenting and examining results of their efforts. Each shot is evaluated as it happens, and techniques are constantly being polished and adjusted. 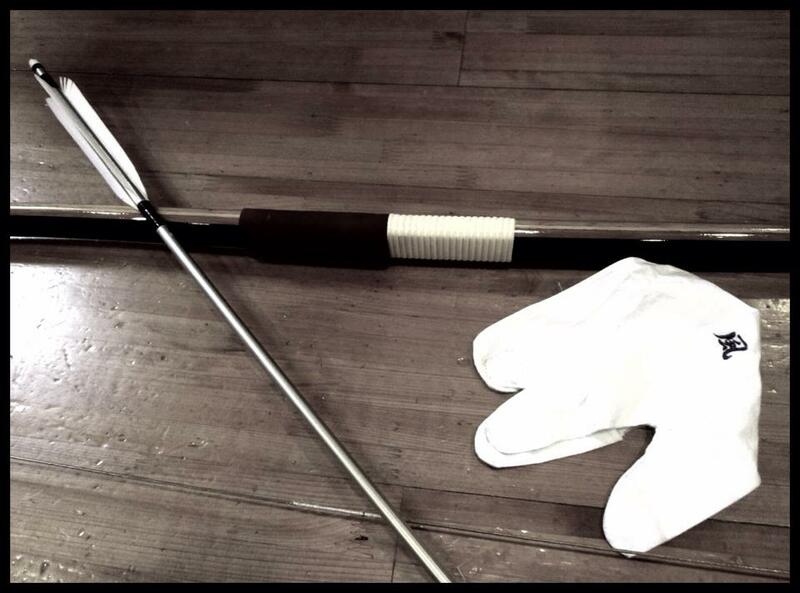 Without this, kyudo cannot be mastered. Meditation, on the other hand, (and I’m less experienced with this, so feel free to correct me) requires the elimination of such distractions. In sitting meditation a person needs to be able to maintain a stable position comfortably enough that the mind is freed from shifting and adjusting an uncomfortable body. Moving meditation likewise needs to be able to perform the movements without discomfort or distraction. To me, therefore, it seems that someone using kyudo as meditation must either use a simplified kyudo-like kata without attempting to master kyudo, or must have thoroughly mastered kyudo to the point where it is a non-conscious process. I would love to be able to blend kyudo and meditation, but have come nowhere close enough to mastering kyudo to do it non-consciously, and would not want to perform “simplified kyudo-like kata” for fear of ingraining bad habits in my form. Is there a happy medium between these two situations? 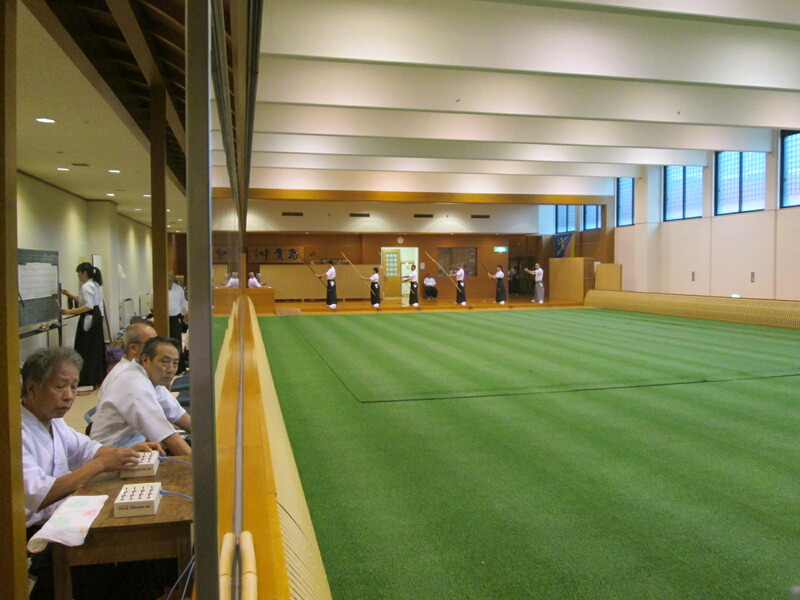 I see both testing and competition as ways of keeping kyudo “real”. Periodic reviews and evaluations (tests or shinsa) by qualified masters of the art are the best means of making sure you aren’t following a “daydream” version of the art – of staying on track. And competition can verify the effectiveness of the techniques in the closest thing that is left to us of the martial aspect of the martial art. Without something to measure against we don’t know the extent of the progress we are truly making. And measuring only by whether it feels good doesn’t tell us whether our skills are improving or our imaginations and delusions are growing. The responses went on and off topic. It did give me something to think on. This was/is an interesting thread. Even the many parts that were not on topic. I would like to interject my thoughts. I notice a fair amount of discord based on the interpretation of words. It is somewhat like getting lost on the finger-pointing to the moon, when speaking of its beauty ( the moon). I feel what Hartman Sensei had to say about basically comes down to what you want to think of what you are doing, makes sense. 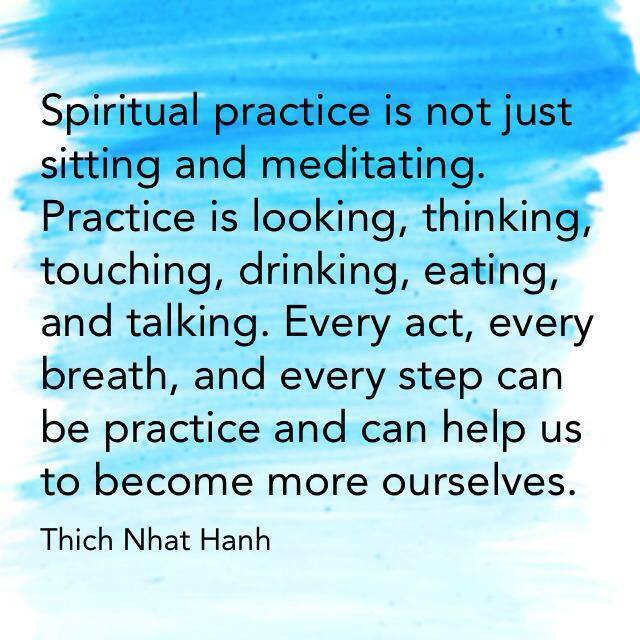 An example are the words of Zen Monk Thich Nhat Hanh “Spiritual practice is not just, sitting and meditating. Practice is looking, touching, thinking, eating and talking. Every act, every breath, every step can be practice and help us become more ourselves. 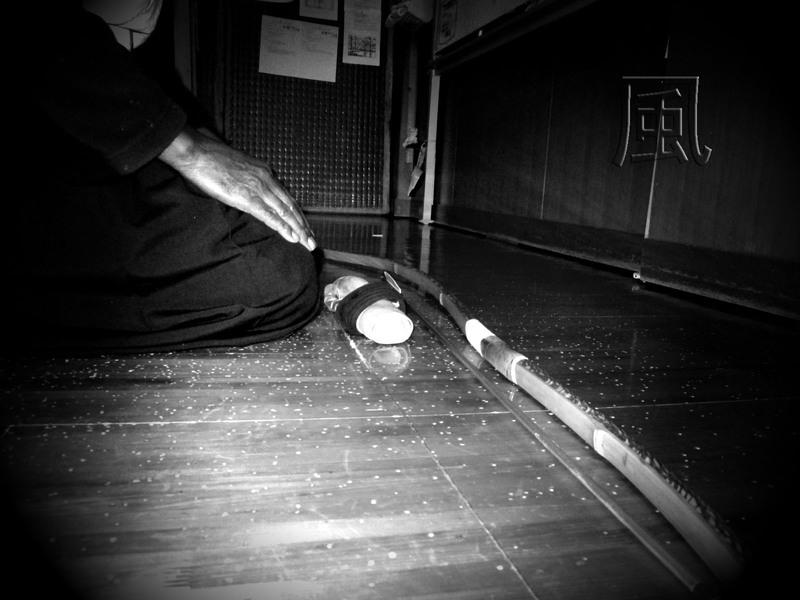 ” Is this not part of the goal of Kyudo to bring out the Shin Zen Bi within us. On there being a separation of Kyudo and Meditation. You stated you have not reach a level where you can do both Kyudo and meditate At the same time. Perhaps a definition of meditation would have helped clarify things. Mindfulness is called meditation, Zen has a meaning of meditation, focus has the meaning. Reflection is also meditation. There are many forms/ ways, styles of meditation. Some will work whilst doing Kyudo, some need to be done before or afterward. There was a statement made concerning totally emptying the mind. Stopping thoughts. A Zen master once asked me ” can you do that? I can not, the mind is designed to think. You can not stop that, but you can stop being attached to the thoughts. I find solutions to issues when I meditate.” It is a time to expand ones thoughts, examine one’s actions. In my “style” of Shaolin Chan (Zen meditation) we sit, we learn/practice to go beyond the discomfort of “just” sitting. Removing external distractions, by going inward. We focus on our breath, and certain “points” of the body. In these points we focus on finding energy /Ki, this Ki is “sent” to other location, for “use”. This is not just sitting to empty one mind of thoughts, there is a purpose…sitting Meditation. This same state of mind, awareness, is present in Motion Chan, Moving meditation ( Kung Fu, Tai Chi Chuan), Kyudo. It is said in some schools of Zen. If you sit with the purpose of becoming enlightened you are moving more away from it. Others say, if you sit without the purpose of reaching enlightenment you are just doing “form”. So many opinions. There is also meditation that involves chanting, not practical for doing Kyudo, but my point is there are different ways of meditation. 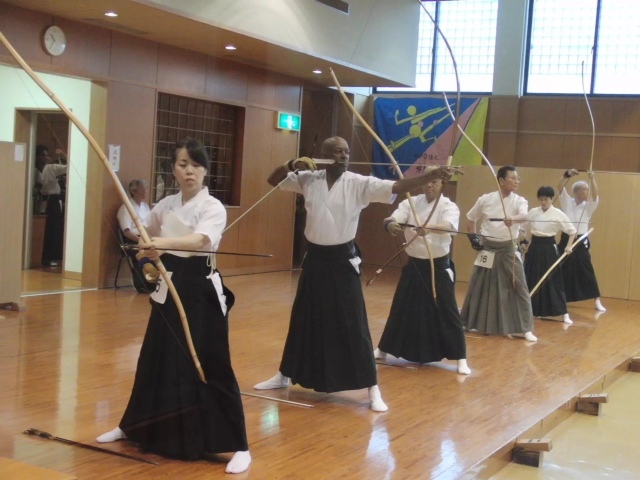 Depending on the meaning ( form of practice) one wants to place on the word would determine if one can do it with Kyudo, or as part of Kyudo training practice. 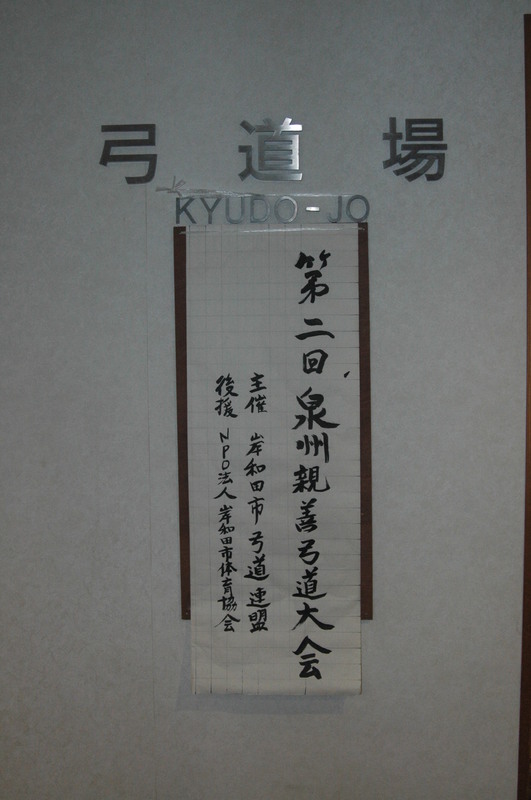 The Kyuhon itself speaks of Kyudo and Standing Zen. It really to me all comes down to the person who is doing it interpretation, or “heart”, intent. Just my opinion from a beginner level of Kyudo and longer term meditator. Meditating/ focusing /mindful on the correct Ashibumi, Dosukuri, Tenouchi, holding kiza, ignoring the crowds, voices , judges, but alert to your place in line and group timing. Is to me a form of Meditation , there is no duality. However it is not the Soto Zen style Japanese way of sitting in front of a wall to non-attach to thoughts meditation. 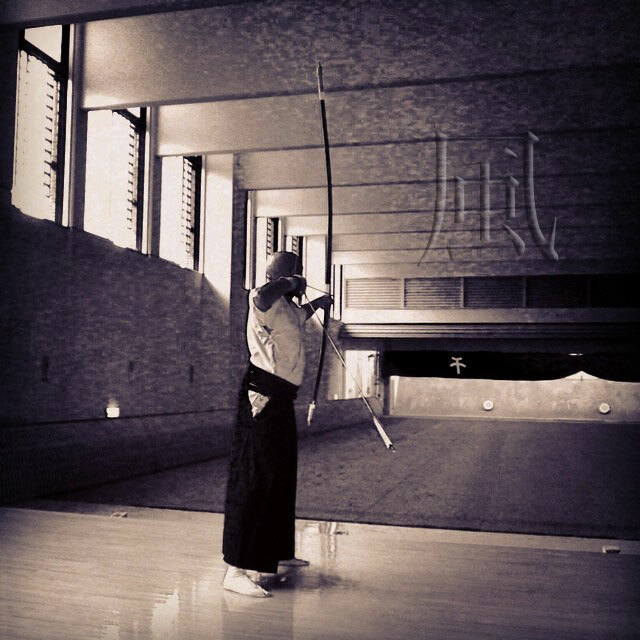 This “Zen” ( meditation) is not Kyudo, or practical for use doing Kyudo. One of my Kung Fu teachers said, one should not have to stare at a wall to have, be in a meditative state. It was a rainy but warm day. 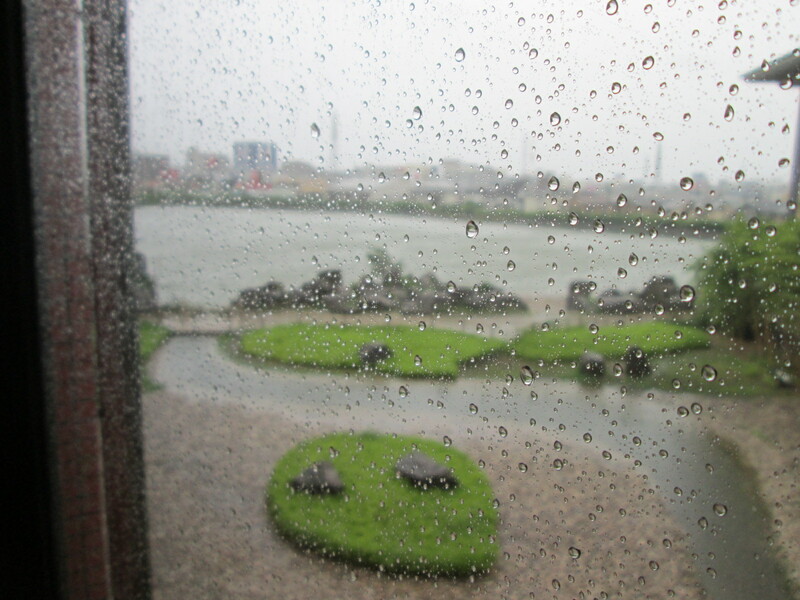 It felt like the topics as I stepped out into the world on a Summer Sunday wet afternoon in Osaka. I was prepared for the wetness I thought. I had on knee high shorts, sandals with no socks, an umbrella, and most important my Yumi wrapped in a plastic bags. Plastic has some value (but not in the Oceans.) My new Yumi. Not just new to me, but new, said in gratitude to the Universe, new unused! I did a fair amount of research, before selecting this one. I spoke with two owners, both were satisfied , I purchased a Bamboo core, covered in carbon fibre Yon-sun Yumi. I sold my Symansky Yumi which is 18kg. Usable but to much strain on my shoulder I felt. 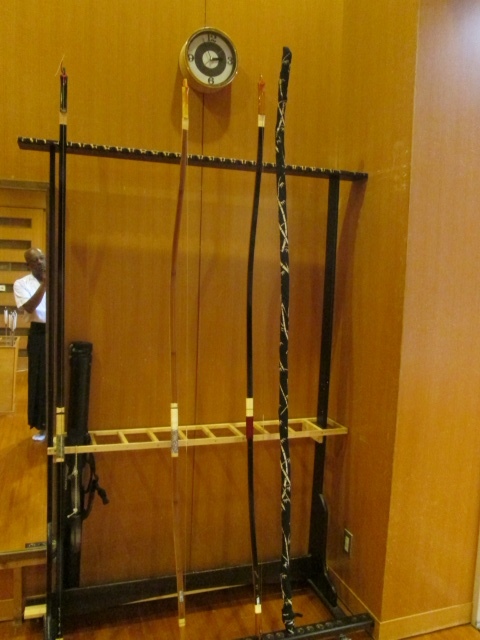 It was sold to a guy in the north who has done Kyudo for 50 yrs. Sugoi. He was pleased, I was pleased it got a good home. The cash from that plus a couple of days salary from the new job, covered the cost…and it arrived before my birthday and the Tai Kai. This is only a 14kg, my Bamboo was 15. I figured this was a good weight, for my shoulder. Enough resistance that I can feel the Yumi but enough to relax into the position and focus on the stretch, the expansion to to release. Today was the beginning of the relationship, our journey to Yondanship. It was a good day at the dojo, cloudy, rainy. Not many people there. only two by the time arrived. and they left soon enough. I even took the time to do a bit of meditation before shooting the Dojo felt that peaceful. Totally I had the place to myself for the last hour. I got in some nice solo time practice with the new Yumi and some picture time. It was nice to just get in some shooting time, no worries about corrections. I got to spend sometime just feeling the Yumi. The balance, the vibration, the spirit. It has a spirit, the inner Bamboo gives it a different, feeling than just a carbon or Fiberglass, bow. It feels close to full Bamboo. I like it. This Yumi feels like my old 1st Yumi. The weight of 14kgs is good. It is enough that I can somewhat lean into the Bow, yet, I do not struggling with the power so I can focus relaxing into the position, into the draw. Especially when expanding in Kai I feel the weight is right. I can focus on expanding correctly, and relaxing rather than shifting chi to brace the Yumi power. The Tai Kai is next weekend. I will not be the factor to deal with I had the brief fantasy about, what with having the new Bow and basic undeveloped skill, however I will be there. Perhaps even get a couple of hits. My next thing is to get my Kimono in order. I have a Kimono for shooting. I need the inner lining still and I want to have the family Mon embroidered. I said it needs to be white, right!?? I was told by the Sempai. I encountered a woman at the food market on the way home tonight. She saw my Yumi and asked about it. Where I practiced. etc. 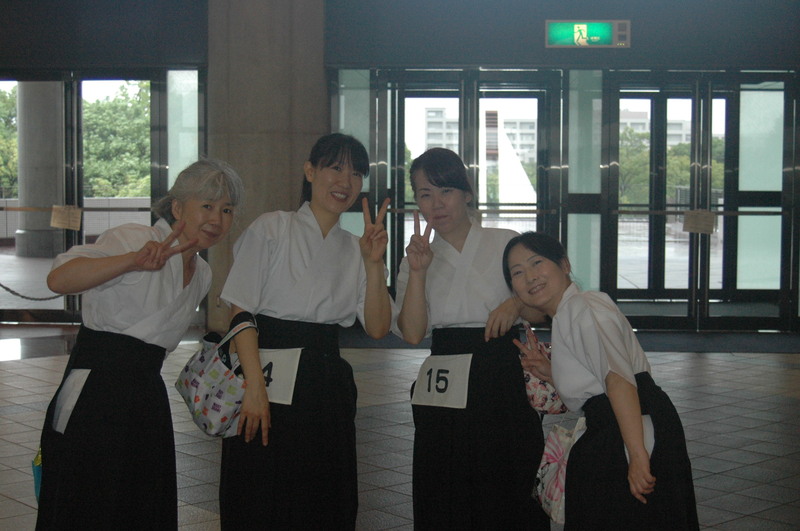 She also asked why I do Kyudo.? I did not have the words to explain fully or clearly. I will need to work on that. What she got out of it was, balance. it gives, me, helps me with Balance in life, it is a challenge, it is interesting. Her son does Kyudo, she was trying to understand why, better. She was the first person who asked why I do it. It gave me pause for a moment. These random chats with locals is always a surprise and interesting that they are brave, interested enough to speak to me. hahaha, the high point of the dinner conversation. Maybe I will name the Yumi, Kannon ( Kuan Yin). My first boat was named that. The new owner recently wrote me saying he was setting up a blog on her upgrade. It is a good name for a Yumi. I have been working steady at the city job now for a couple of few weeks. It is not that hard, but not easy starting a totally physical job at this age. I am looking at it as “Fu” training as everything is that anyway. This is my upper body training paid workout time. I am only doing it two days a week. It helps survival protocol 1. “Survival only the strong can survive…Grand Master Flash and the furious Five. After the first couple days of trimming park bushes, the rest of the time I have been on cleanup detail. Meaning most of our, my work has been “bush” clearing on overgrown land. The Sempai cut with power saws, I rake, and gather, then load on truck. After the Sempai have done with their cutting, then I get some help. One would think, oh ,just bushes… This gets heavy fast with a lot of them. Additionally a lot of this work has been on a hillside of some sort. Sometimes Holes, glass bottles, trash. The other day a sempai said something to me. It took me a long time and being shown a dead one on a stick, that he was talking about snakes. The area in the shot below the green background came all the way to the road. I have soreness in my left forearm from the raking, I switch up sides to compensate. It is like old school training both arms/ side to use a staff, spear or whatever weapon. I look at it as staff training, when raking, other times, tiger fork, using the fork. Sometimes it is just new muscles, sometimes it is about lifting wrong. Having a martial art background, I analyze movements, and when I am doing them and something starts to hurt, I need to figure out why and adjust or adapt. It is kind of like Kyudo, if you do not hit the target, you figure out what is you are doing out of balance with the shot and correct it. Here I can figure out a way helps use muscles more harmoniously. Like using more waist and less arm when raking, legs when lifting. Stance when lifting and twisting. Everything is training, the world is our Dojo. Makes things more interesting, less boring. It really is a meditation practice. This fork, this groups of bushes, lifting this load. The Sempai I have teamed with so far have all been nice and easy to work with. The other day the “Kaicho” took me to the dump with him, to unload the truck. Huge place, so much trash, stinky, it was interesting. Something your everyday gaijin does not see. below is a pix of 1 shoot of 6. over a 20ft drop to the bottom of trash! We get a break from working about every hour, for seems like 15 min. Then an hour break for lunch, after everyone eats they usually take a nap. I am the youngest of the lot. Most are in their 70’s and 80’s, fit old dudes to do this kind of work. Even not consistently hard, it is, can be a challenge. The photo foreground below, looked like the background of the shot before we cleared it, high as the start of branches in the second tree, at least 6ft tall. I had another bit of a shock the other day, when one of the supervisors stopped at a store while dropping me off at a work site and treated me to breakfast. These everyday people are nice. I have not gotten any sense “weirdness” from them. I speak, they speak, I work, I sweat, they work, they sweat. We are sweat brothers.